The novelty of a menu on an Ipad instead of paper is certainly amusing, but my first impression was that it was probably going to end up as the only impressive part of Carmel Cafe & Wine Bar. I’m happy to say that I was wrong with that assumption, and that the food was better than expected. Gabriel and I went in for a late night dinner after yoga class when there’s not much open and restaurant choices are limited. We were seated right away and given our Ipad to browse through. After scanning through pages of options for small, sharing plates, we decided to ask our waitress for some suggestions and advice. She told us that the flatbreads, salads and a few other dishes were the standouts, and that we should start with one or 2 two plates with intent to order more as we went along. We took her advice and started with the Grilled Lemon Chicken & Artichoke flatbread with arugula and parmesan (deliciously chewy, crisp and full of flavor. I especially liked the candied lemon peel on top) as well as the Red & Yellow Roasted Beets with goat cheese, watercress, arugula, toasted pistachios and a vinaigrette on the side. I adore beets, so this was an obvious pick, and it didn’t disappoint at all. The roasted beets were slightly sweet, not over-cooked at all, and beautifully colorful with the greens. The combo of lettuces and nuts with the cheese and beets was wonderful- both in their flavor and texture. When were near the end of those 2 plates, we sent our next order via Ipad to the kitchen. I must comment that the turnaround time is super fast, and you really can order plates and expect to get them in 5 minutes or so. It makes me wonder if everything is precooked and just reheated when you order, which isn’t great, but still- the food tasted pretty darn good. Our next order was the calamari & cannellini with herb marinade, pomodoro, and pancetta and the meatball lollipop pomodoro with fresh pomodoro sauce. The calamari was ok- but I didn’t love it. I do adore calamari in general, but somehow, even with the nice assortment of herbs, this lacked flavor. The meatballs were also kind of boring, nothing special- even though the waitress had recommended them as a favorite. We were still a bit hungry after finishing those 2 plates and decided to order one final one. We settled on the chickpea fries with tomato jam (YUM) and curry aioli. I have to say this was a big hit for me. What a cool concept to have crispy, crunchy fried outside with a creamy, melty, hot, inside of chickpea puree. I really loved the sweet and tangy tomato jam that it came with and the adorable Jenga-like stack it was presented in. I polished off more than my fair share of this plate. Overall, this was a fun experience with better-than-average food. It’s a great option when you want a meal later than most places are open. We have yet to try the wine pairings and the desserts, but intend to soon. The atmosphere is also very cool and hip- especially for Florida. (sorry Florida) The one thing we struggled a bit with was what to tip. The waitstaff definitely have it pretty easy here and tipping the full 18% that we usually do didn’t feel right. We went with 15% instead and hope that was ok. Fun place for a date or a meal with a big group- these are definitely sharing plates and that’s one of the main reasons I really enjoyed it. I am going to have to start with dessert. No, I did not start the meal that way, but I just can’t stop thinking about it for long enough to start my review with anything else. This is passion in a cup. No. This is what the most succulent, romantic, seductive, indicative-of-a-lasting-love type of first kiss would be if it were translated into a dessert. This is serious. The dessert which is simply titled *S’mores is so much more than that. This is no Hershey bar. This is not a boxed graham cracker or a Jet-Puffed marshmallow (not that there is anything wrong with any of those things. The classic s’mores has always been one of my favorite treats on the planet) This is a S’mores as you knew it from childhood campfires that has been elevated to the utmost level of sophistication and indulgence. The crisp brulee topping of the homemade marshmallow shatters as you chip your way into it. Underneath the shell, you’ll find the creamiest, most heavenly, smooth, rich, chocolate you can possibly imagine. You may think, at this point, that you’ve arrived in heaven, but then you’ll dig deeper to find the crumbly, cinnamon-y goodness in the bottom layer of graham cracker that will bring you over the edge. Sigh. Yes. This is the kind of dessert that leaves you wishing you still had enough stomach space left to order another one. Or 6. The rest of the meal was equally exquisite. It’s so awesome to find a creative, original, NY-type restaurant SO far from the hustle and bustle that I moved away from here in Florida. The vibe that you get from the food and the friendly chef here is low-key, fun, quirky, whimsical and casual, although the decor really doesn’t seem to match that in my opinion. It’s more subdued and traditional looking (except for a few pieces of art) and I think they’d do well to try to connect the food and feel with the atmosphere a little bit more. That said, once you start eating, you’ll be looking more at your plate than your surroundings anyway so it really doesn’t matter. We decided to share 5 small plates. I love when a menu provides that option because as far as I’m concerned, I’d always rather try lots of little things than be stuck with one entree per person. We started with the lovely little parmesan rolls they served- which reminded me very much of miniature popovers. Although Gabriel felt they were on the dry side, I rather enjoyed the eggy cheesiness of them along with their petite size. Just enough to take the hunger edge of without putting a damper on my ravenous appetite. cherry tomatoes, crispy onion rings (probably the best onion rings I’ve ever had), blue cheese emulsion, and warm bacon vinaigrette. The concept of this dish is one that’s on plenty of menus, but here Derek puts his own spin on it and somehow reinvents it into something much cooler than the typical wedge. We then moved on to our 3 warm plates, one was a special which consisted of a perfectly poached egg over roasted oyster mushrooms and peas, one was the pan seared sea scallops with white chocolate & parsnip purée (So delicious, unexpected, rich and creamy) english peas and mint, and the third was the clams with smoked pork- another special that I wish I could describe more accurately but to be honest, I forgot what the elements were- I just know it was excellent. Overall, I can EASILY say that Derek’s is my new favorite restaurant in the area. There is no question at all that I will be back sooner than later, and probably frequently. I should add that the service was on point, and that I really enjoyed chatting with the chef when he came over to our table to introduce himself. It’s very cool to see that a superb restaurant like this (that’s not even on Main St.) has it’s tables full, even in the ‘down’ season. With food of this quality, it’s no wonder why. See you soon Derek! Yes, it’s true. I am writing a review for a fast food place. Is that totally ridiculous? No! Not when it’s fast food that’s actually real food! Not when it’s fast food that doesn’t mean greasy burgers and soggy fries! I met my dad here for a quick lunch after he had told me what a great option it was and I’m very glad I did. 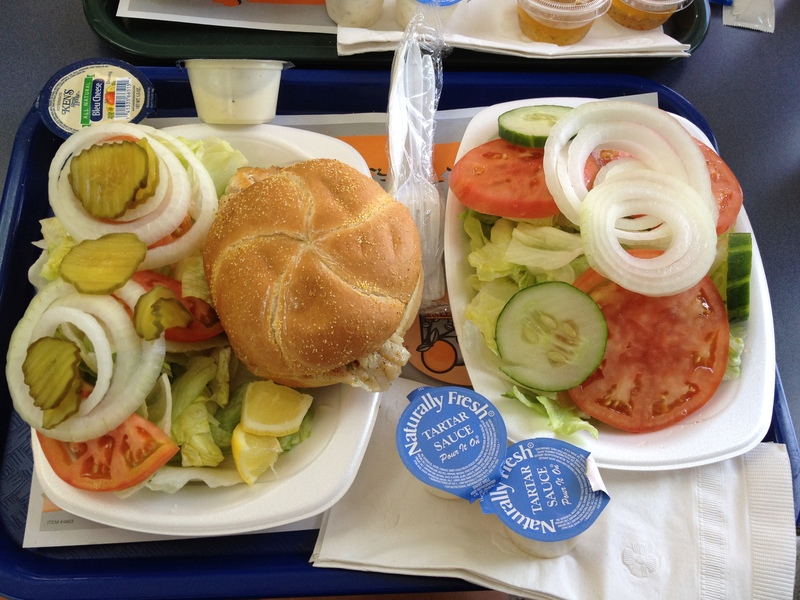 For $6, you can have a grilled fish sandwich (I had basa, which I’d never heard of but liked), a drink (which, in my case was a 1/2 iced tea, 1/2 lemonade- one of my favs) and a side salad (just iceberg, tomatoes, cucumbers, and onions- nothing special, but not bad). You get your fish on a fresh roll (and a pretty good sized piece of fish at that), and 10 minutes later, you have finished your relatively healthy meal, and are satisfied without feeling that typical post-fast-food feeling. If you’re in a rush and starving, this is a great choice at a great price. I’m sure I’ll be back and will probably try the tilapia, the grouper, or the shrimp next time. I also found out they are planning to open a branch in Bradenton which will definitely come in handy for me since I live near there. Thanks G & S! After realizing that there really wasn’t much seafood at the shrimp and lobster festival at the Sarasota Farmer’s Market yesterday, Gabriel and I decided to get a couple of snacks instead. When I saw that there was an empanada vendor, I went to ask about the beef empanadas. Many years ago, my Argentinian friend made a batch of the most incredible empanadas ever and I’ve never found anything that came close. One of the big differences between the ones he made and the ones I usually see were the raisins. I LOVED the sweetness that they added to the savory beef. Well, you can guess how psyched I was when I asked if these had raisins and was told that indeed they did. YAY! At $5 for 2, I ordered a beef empanada and Gabriel got the spicy shrimp. They were both excellent- but I was ESPECIALLY excited with mine with included beef, raisins, green olives and hard boiled eggs. Now, I realize that these ingredients don’t sound like they’d be delicious together but PLEASE trust me when I tell you that ohhhhh yes they are. What an odd coincidence to realize that the empanada vendor was related to the pasta vendor from which a friend picked up some homemade pastas for me that I am picking up later today. If the pasta is even nearly as awesome as the empanadas, I will be a very happy foodie tonight! YUM. Thank you. It was a HOT day at the Sarasota Farmer’s Market today. 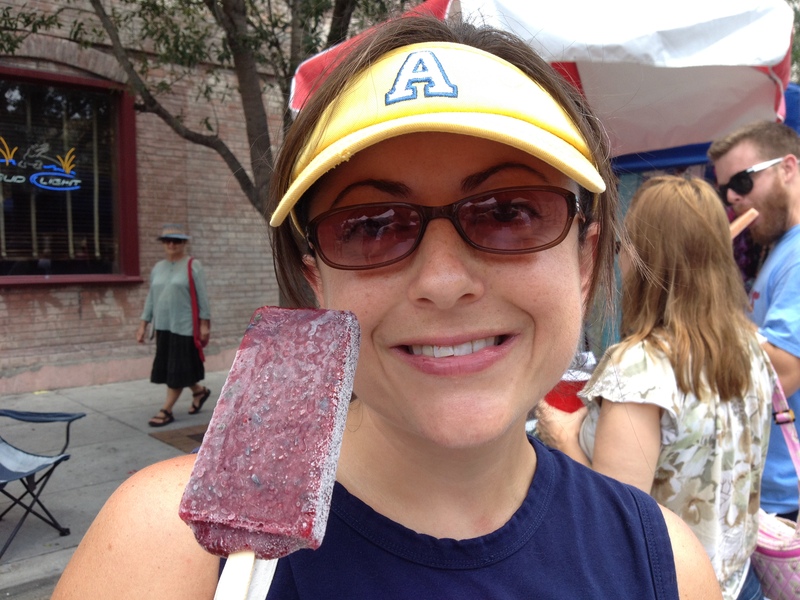 Not a cloud in the sky and pushing at least 90 degrees, what better way to cool off than with a delicious, refreshing, icy cold artisan popsicle!?!? The creative and unusual flavors handwritten on this vendor’s board were what caught my eye and I couldn’t resist. I chose the blueberry/lemon/basil flavor and was SO happy I did. For $3, I had a wonderful and healthy snack that was bursting with farm fresh flavors. It cooled me off instantly, and I finished it before too much of it could melt it’s way down the stick. FANTASTIC. I can’t wait to go back and try the other flavors. YUM. rehearse with my duo, Painted Echo (please see http://mikesolomusic.com/home.cfm for more info) It was not hard to find time to swing by. It was 95 degrees out on Sunday so after rehearsal, I decided it was the perfect time for a refreshing treat. I pulled up to a fairly full parking lot and people happily licking cones on benches in the shade. I went up to the counter and asked which flavor they suggested, and they told me that the orange/vanilla was by far the most popular. Thinking back to how much I loved creamsicles as a kid, I was excited to try a homemade version. The woman who made my cone was nice enough to hold it for a photo before the melting began. I can honestly say that I ended up eating it so quickly that I had no need for a napkin. All dripping was easily averted. This is a delightfully refreshing treat indeed. The vanilla is creamy and the orange is a bit more on the sherbet-y side. It’s lower fat/calorie than most ice creams, and didn’t leave me feeling like I had just totally pigged out at 4 in the afternoon. Nope, no dinner spoiling here, just a wonderfully cold snack with awesome flavor and charm to boot. I’ll be back! As a native NYer, I have been avoiding pizza since I moved to Florida for fear that a food so near and dear to my heart would be so poorly represented that it bordered on criminal. 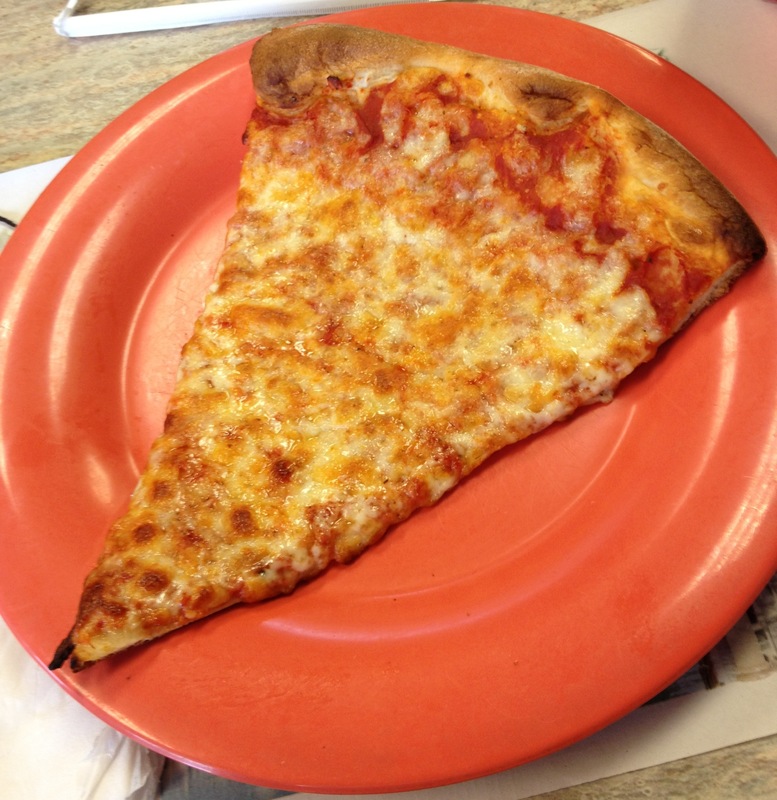 A few people I know have strongly recommended a couple of places so I have begun my sampling process- one slice of plain cheese pizza. Today was my first stop, Michelangelo’s in the Summerfield Plaza at Lakewood Ranch. When I pulled up, it was packed with people eating and picking up their orders, and the very busy employees behind the counter had the crowd control totally under control. So far, pretty New Yorky indeed. The first bummer was that I couldn’t just order a slice at the counter and then go sit down to eat it. No, this is to-go or table service only. Womp womp. Well, ok. I decided to sit and order my one plain slice and a glass of water. It took much longer than I would have guessed- but I wrote it off to the crowded tables and the fact that I was only going to be paying a comparatively measly amount of money. I noticed that a lot of patrons had brought their own wine and glasses, and overheard the waitress explaining that the proximity of the restaurant to the daycare center behind it was the reason that they were not allowed to serve their own. The food on the tables around me all looked and smelled great, and it seemed that lots of people go there for meals other than pizza. I saw a few bowls of pasta, some different parmesans, some salads etc, that all looked good. When my pizza finally arrived, It looked pretty darn good. Melty cheese, not too greasy, and piping hot. I had my first bite. Hmmm. Everything seemed to be on point…The crust was good- crisp and a little chewy, the cheese was good, melty and stringy, the sauce was good- fresh and tomatoey. But something was missing. Hmm. What is it? Oh! It’s FLAVOR. Ya. Not so much. I really couldn’t figure out why, but I ended up sprinkling on tons of oregano, garlic, and even salt- something I NEVER do, just to get it to taste like something. Sigh. This ain’t NY. I was also really not thrilled that I had to leave a tip for one slice. I ended up spending about $3 instead of $2 and change. I would STRONGLY prefer being able to order at the counter like at most places. Despite my less-than-awesome review of the pizza, I think I probably WILL go back. Next time, I plan to add a bunch of toppings on to the fairly decent platform in hopes of making it taste more like something. Anything. Until then, my quest for a good, straight-up, cheese slice continues.